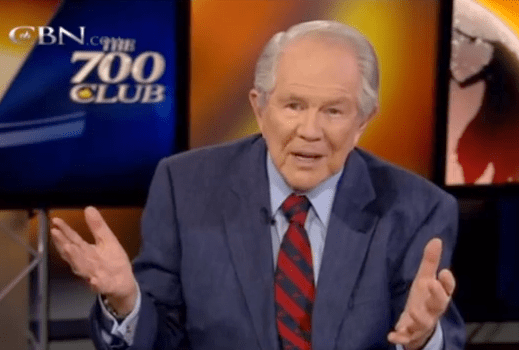 On his “700 Club” show, Pat Robertson told viewers that people are gay because they were sexually abused when they were younger. The conversation came up when a viewer called in needing advice. She wanted to pray for her 30 year old nephew who is gay, but thinks her nephew needs to pray for himself. “So what’s he going to pray about? Is he going to say something is wrong and he’s unhappy? And if he’s unhappy and realizes he is doing something that makes him miserable, you might help him. Robertson then went on to say that gay people need to be shown the Bible because all gay people where abused as a child. Robertson backs his belief with his following statement saying that homosexuality used to be considered a disease. So instead if Robertson using his platform and television show to condemn sexual abuse or child abuse, he uses it as an excuse for why people are gay. Robertson is truly as disgusting as he thinks the LGBT community is. This old fart is more than disgusting. He is clinically brain dead.